According to Land-use consultancy Dresdner Robin, of Jersey City, N.J., they recently worked with the Borough of Pompton Lakes, N.J., using image-capture UAV flights to gather overlapping photographs of three rivers in the borough. Since then, the firm has been involved in various mapping projects. Dresdner Robin uses a professional-grade UAV that can ascend rapidly and reach speeds up to 50 mph. Dresdner Robin’s UAV is equipped with a 20-megapixel camera with a mount that allows for independent positioning and rotation, according to company materials. The altitude of the flight is determined by the dimensions of the area to be surveyed and the angle of the camera lens (which can be changed, depending on the project). Dresdner Robin Survey Director Greg Gloor volunteered to assess Pompton Lakes’ flood-prone waterways and flew 11 individual flights over the rivers – 215 feet above the water level. According to company materials, the UAV moved at 10 mph, using a 15-millimeter, fixed-zoom lens, capturing 60-foot sections of the terrain. Images were snapped every two seconds (1,042 total) and were later analyzed to locate obstructions in the river channel. The photos contributed to a stream-cleaning project serving as part of the borough’s flood mitigation program. 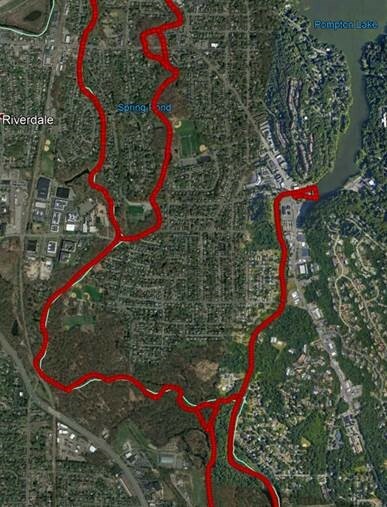 The Ramapo River in Oakland, N.J. is another area where Gloor’s work has helped expand similar waterway assessments. Using both video and still photography and including coverage of adjacent tributaries, the data is used to assess river conditions so they can benefit from restorative work. Flooding continues to plague areas of northern New Jersey, especially following a particularly wet 2018 and now winter storms of 2019. As a result, surveyors anticipate the need for survey and data acquisition of river corridors to increase. Those from Dresdner Robin involved in these efforts answered some questions for AECCafe Voice about the work they are doing. How are flood insurance premiums lowered with the use of new UAV images? The UAV images are used to satisfy the stream inspection requirements of FEMA’s Community Rating System (CRS) program. Complying with CRS program requirements earns participating communities discounts on flood insurance policies for properties within that community. When did the stream-cleaning project take place? The UAV survey was conducted in April of 2018. Stream-cleaning projects guided by the UAV survey data were performed during the summer and fall of 2018. Besides stream-cleaning projects, what other benefits do the image captures offer? The UAV images satisfy the stream inspection requirements of FEMA’s CRS program. Additionally, the images pick up river bank conditions, showing the effects of recent storms and erosion, as well as incidents of dumping or pollution discharges. We captured at least one occurrence of a property discharging into the river. Are the surveyors able to do work in between or during the flooding events – how does that work? UAVs may be used for post-flood damage assessment by disaster response agencies. Surveyors would not be conducting a UAV survey during storm conditions, but flights can be done just after storms while flood conditions exist. Imagery for assessing river obstructions and planning stream cleaning operations is best obtained during dry periods, when the water level is low. What is the difference in photo quality between the professional grade UAV that ascends rapidly and slower ones? A professional grade UAV has a camera with interchangeable lenses and a sensor size of over 20mpix. Smaller UAVs typically have fixed lens cameras and smaller sensors (under 10mpix). What types of situations would you use a slower UAV for and which applications lend themselves to the UAVs that ascend rapidly? Speed is not the primary advantage of a professional grade UAV. The goal is to fly the stream while the camera is constantly triggering the shudder. The UAV’s speed is set so that images are captured with a slight overlap, i.e., no gaps between images. The overlapping images allow the end user to see the entire stream. A professional UAV with interchangeable lenses offers more options, allowing for flight at a safe altitude while appropriately framing the subject area. The framing for this project was riverbank to riverbank. 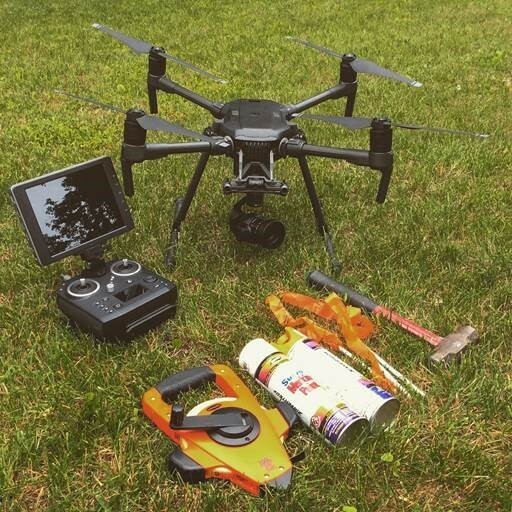 How do the surveyors insure their own safety while flying the UAVs and gather necessary data at the same time? We fly from safe areas and clearings along the stream, eliminating the need to traverse steep or unstable banks. We always consider recovery contingencies in the event of a forced landing. We also always fly in accordance with FAA regulations with regards to commercial UAV operations. What is the cost of this information gathering method as opposed to past methods of data collection during flooding for this location? The river flights were done over four days that spanned three weekends and could be done by a one- or two-person crew. Previous methods of assessing the river conditions required the walking or canoeing of the full length of the rivers, which generally required a minimum of 40 manhours for fieldwork and another 20-plus hours of data management and organization afterwards. Data collected from the UAV survey is considerably more accurate than data collected through previous volunteer efforts. This entry was posted on Thursday, February 7th, 2019 at 6:58 am. You can follow any responses to this entry through the RSS 2.0 feed. You can leave a response, or trackback from your own site.